I have written about having brunch at Privé Cafe in a previous blog entry and how much I enjoyed their eggs benedict. I decided to give their dinner menu a shot since I know they serve good comfort food. 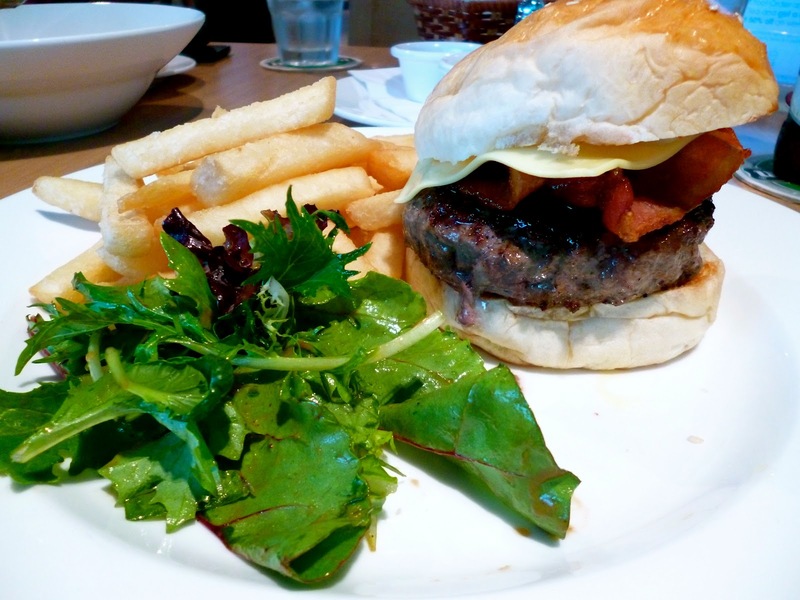 The husband and I were instantly attracted to the wagyu burger choices and decided to indulge on these beefy dishes. 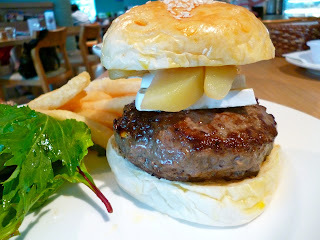 The husband had the Brie-licious Burger (SGD 26.00). This was a wagyu beef patty topped with brie cheese and grilled pears. Lovely combination of ingredients, and the wagyu beef was incredibly juicy. I love the bun used as well which was reminiscent of an old fashioned home-cooked burger. I had the Simply Privé Burger (SGD 26.00) which also featured the wagyu beef patty, but this time topped with streaky bacon. The wagyu beef was really phenomenal. This version is more suited to meat-lovers like myself. For my fries, I had asked for truffle mayo to be served on the side which gave me the truffle flavor I have been craving for. 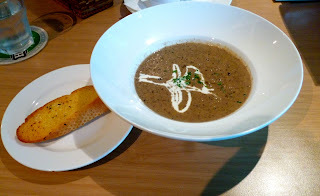 On the side, the husband also had Privé's Signature Mushroom Soup (SGD 13.00). This was one of the better mushroom soups I've tried -- very fresh taste with just the right amount of cream. The dinner choices were just as satisfying as their brunch menu, so we were quite pleased with our meal. The burger was fabulous, and portions were really generous as well. In fact for those with lighter appetites, you can do with splitting a burger between two people. Looking very delicious,If added some red chilly sauce will provide much better taste.. I would have to pass on the chili sauce. Chili sauce on wagyu beef would be a crime in my personal opinion.